Gas powered pressure washer models are almost available from all front line manufacturers of pressure washersand steam washers namely NorthStar, Simpson, Campbell Hausfeldamongst many others. In general gasoline powered pressure washers are found in the higher PSI range from 2600psi to 4000psi. This is because more powerful washers will need to run on an engine and engines are best powered by gas and not electrical power as is the case with electric home pressure washers. In most cases gas pressure washers are for medium to heavy use in homes with demanding projects and more frequently on commercial ventures and industrial plants. The clear advantages of gasoline (or petrol) washers is the power the washer produces, the mobility it gains by not having a taggy electric cord as well as the durability of the machine itself. In general engine powered washers are designed to last longer than residential electrical pressure washers. The downside of things is the price they cost, the noise they make and the emissions they produce. Gas powered pressure washers are essentially pricey. It is impossible to get a $100.00 gasoline powered pressure washer which you can easily get from FAIP, for example. 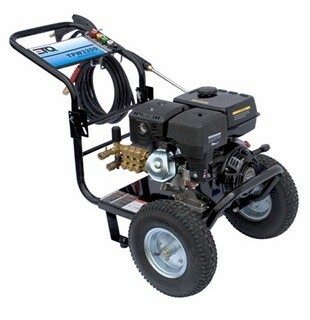 Gas powered pressure washer models range in price from $400.00 to as high as $5000.00. In general the machines are noisy that makes them less ideal for home use apart from the emissions. However advanced manufacturers such as Honda make some of the quietest washer engines on the market today which are also designed to have lower emissions. This is essentially what makes Honda powered pressure washers desirable and constantly in demand. Selling for $600.00 this washer is powered by a gas Briggs and Stratton 1150 Series OHV engine 250 cc. This is a washer designed to release lots of power for your heavy and commercial needs. Giving water pressure of 3400psi at 2.8GPM of flow this is your typical paint stripping machine. Pressure can be adjusted apart from employing the range of nozzles supplied with the washer to handle specific cleaning jobs. still on nozzles this washer has its own innovation which presents the ProjectPro Nozzle System. This simply mean the nozzles are designed for delicate, general or max jobs including soap/detergent spray. Talking about user feedback on this machine, first-off the engine is difficult to start. We are not surprised it's a plugue associated with Briggs and Stratton pressure washer engines. This is what drive people to Honda powered washers. You will make do with a few pulls to start a Briggs against a single pull to start a Honda. This is a recoil system new and unfamiliar users have hurt their fingers before. The recoil system is used in most gas powered pressure washer engines including Honda. To learn to start a Briggs faster than before you will need to find a right setting for the choke this may take sometime and may not be a guarantee for future fast start-ups. Briggs engines are loud engines. This is makes gas powered washers by them a dispute creator with intolerant neighbors. Appealing in design and nice in presentation this gasoline powered pressure washer costs on average $350.00 but can be found on stores such as Amazon for as less as $329.99. It runs on a gas 190cc Briggs and Stratton engine. This is a 2500psi pressure washer which has a flow of 2.3GPM. Most people go for this gas powered pressure washer on account of its lower price compared to other gas pressure washers for home use. Starting Briggs engines is a task. The company appears to have never been able to solve this problem that has repeatedly come from countless washer owners. Up to three or four attempts may be required to start this washer. Even when it starts running users have complained of the Briggs engine abruptly cutting off. This pressure washer is sure able to run for a season, in the medium to long term the cost will be high in as much as it appears affordable currently. 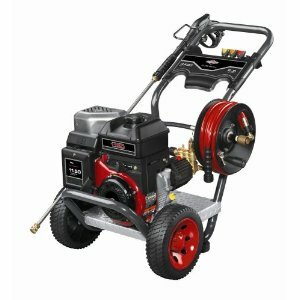 Hardly known, hardly talked about this is a gas powered pressure washer from Eastern Tools and Equipment has overall scored high ratings being thought of as a Honda clone. This washer is powered by a 389cc, 13 HP engine called Locin which is a commercial grade engine. It can be used for commercial jobs and on industrial sites even though some buyers have made use of it in a home setting. The 3600psi and 4.0GPM gives this washer the credentials for a heavy duty washer. This is admittedly not a well known brand but it apparently competes effectively with top of the range pressure washer brands on Amazon. 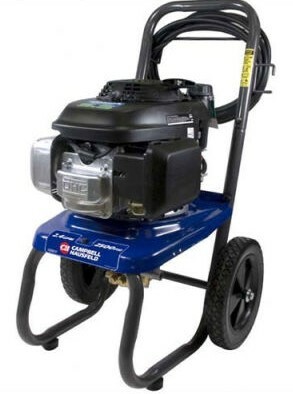 The fact that Amazon stocks this gas pressure washer is also a good sign for anyone skeptical about this obscure brand. 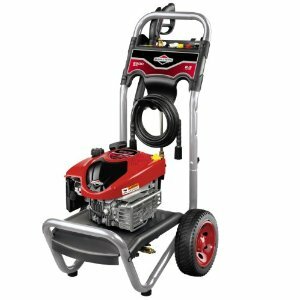 The fact that the engine starts up quickly and has been praised by satisfied users places this pressure washer somewhat ahead of Briggs and Stratton in light of all disappointments. This gas powered pressure washer can run non-stop for up to 2.2 hours. The inbuilt auto low oil engine shutdown protects the machine from self destruction. We have observed that fewer than necessary people are concerned about fuel consumption when it comes to gas washer selection. We believe this is a factor to be considered also because generally the higher the fuel consumption the greater the emissions. In terms of fuel efficiency this pressure washer at 100 percent work load a full tank of gas will last you some 4.35 hours. The fuel tank capacity is 1.72 gallons. 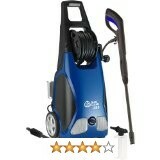 This pressure washer is however relatively high priced selling for $600.00. The CONS of this washer includes the effect of the handle-folding mechanism on the pressure regulator knob, inadequate instruction manual and the loud noise. We cannot say this is a tried and tested pressure washer brand. It is however a good buy if you are keen on trying a somewhat new brand or if you are tired of the old well known names. This is a typical residential home pressure washer that runs on gasoline. With an output of 2500psi at 2.4GPM this washer will resolve all your home cleaning projects such as your grill, driveway, sidewalk, ATV and so on. The best of all is that this gas washer is powered engine wise by Honda's GCV160. 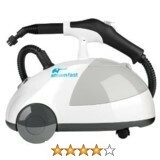 This is a high quality, durable and effective power washer for the home setting. It starts quick and easy thanks to Honda engine built-into the machine. This gas powered pressure washer is highly recommended. It is in our opinion a good buy and worth the money at $450.00. Out concern with gas powered washers for home use as expressed right through our reviews in this site has always been the noise and emissions associated with gas engines. In addition gas is not a good substance to be always using and storing around the home. This is why most home users go for electric pressure washers. The Honda engine on this machine however makes less noise and is also designed to release lower emissions. This is a plus. Read more reviews on this washer. Expect a 25 ft hose with this pressure washer as well as 2 quick-connect spray tips or nozzles. This washer meets the requirements of 50 States across America.